The Music Room is a location in the Game & Watch Gallery series that commonly stores songs unlocked in the series' games and sound effects (prior to Game & Watch Gallery 4). In this game, the Music Room is unlocked by collecting five stars, and the complete song list is unlocked by collecting 55 stars. It is hosted by Mario. When a song is played, Luigi, Toad, and Princess Peach appear to be playing the trumpet, drums, and piano, respectively. In some songs, Luigi does not appear, and Toad sometimes appears to be sleeping. Every song has a different sound effect. There is a total of 15 songs. In this game, the Music Room is now improved by revealing new songs through the game. It is hosted by Mario once again. When a song is played, Yoshi, Toad, and Peach appear to be playing the guitar, drums, and piano, respectively. Luigi controls the tempo of the songs (5 is the slowest and 1 is the fastest), and Wario controls the sound effects (from 0 to 9). This is the only Music Room that can control the music tempo and play any sound effect on any song. It has a total of 16 songs. 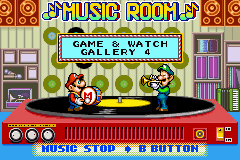 In this game, the Music Room has the same unlock method from Game & Watch Gallery 3, but the music tempo can no longer be changed and sound effects cannot be played. It is now hosted by Mario and Luigi. When a song is played, Mario and Luigi walk on the giant record player while playing a bass drum and a trumpet, respectively. It has a total of 25 songs. This page was last edited on February 18, 2019, at 14:23.